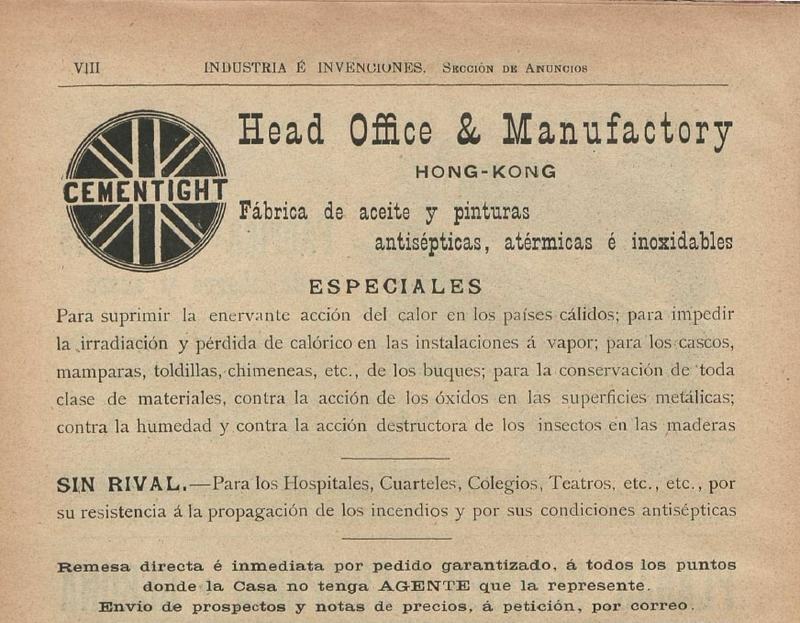 “Anuncio de Cementight,” Archivo China España, 1800-1950, consulta 18 de abril de 2019, http://ace.uoc.edu/items/show/108. It may be mentioned that the Club will be the first public building in Shanghai to avail itself of "reinforced cement," a preparation of Mr. Marti, who has established works at Yangtsepoo. This cement, we are informed, has peculiar properties which enable builders to overcome many of the difficulties of an uncertain soil like that of Shanghai. Industria é invenciones, tomo XXIX, nº. 1, 1898, pag. VIII / Biblioteca nacional de España.